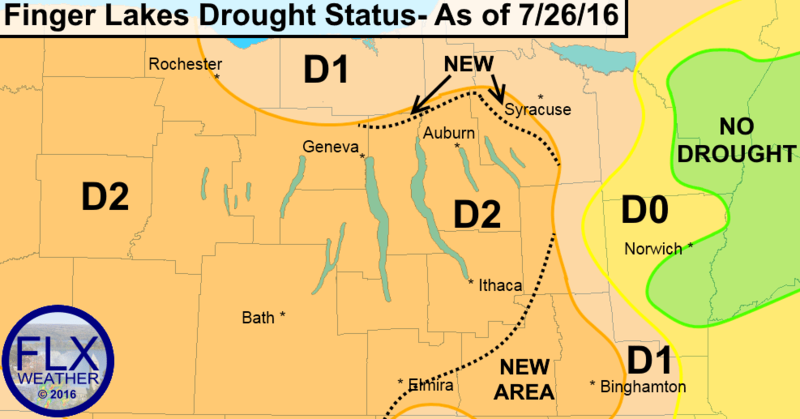 Level 2 drought continues to slowly expand across the Finger Lakes. The US Drought Monitor map for July 26, 2016 continues to shows severe drought conditions across the majority of the Finger Lakes. There was little change in this week’s US Drought Monitor map compared to last week. However, the amount of Level 2 (Severe) Drought did expand slightly. The biggest expansion was across the Southern Tier between Elmira and Binghamton. The vast majority of Chemung and Tioga Counties, along with half of Broome County, have been raised to Level 2. A slight expansion in the northeastern Finger Lakes was also observed, with the Level 2 area creeping closer to Syracuse. The Level 0 and No Drought areas east of I-81 in Central New York remain locked in with no changes to the boundaries. Likewise, the remainder of the Finger Lakes region remains locked in at Level 2 Drought status. Thankfully, there was no upgrade to Level 3 in any areas. Statistically, the amount of Level 2 drought in New York State rose from about 23% to almost 27%. 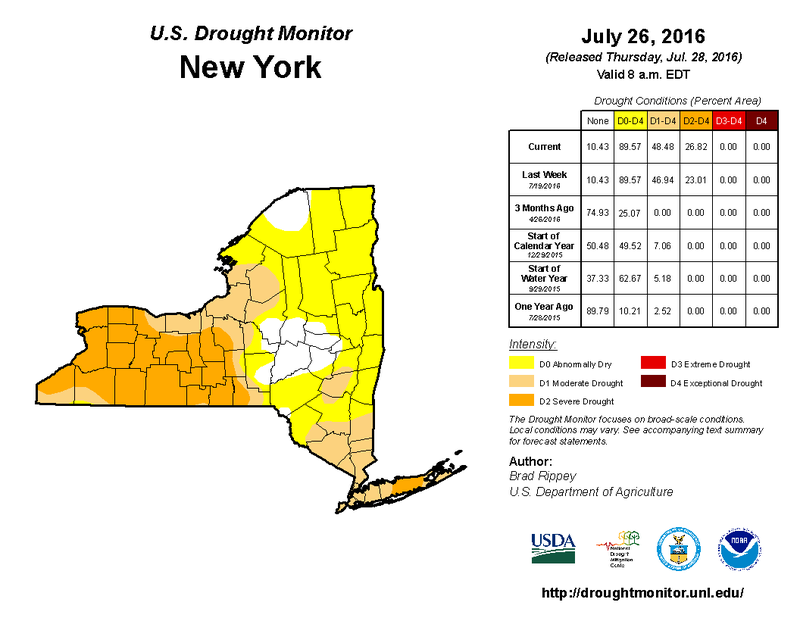 The percent area of New York not in a drought remained steady at about 10% for the third report in a row. The US Drought Monitor reports weekly and uses a variety of data sources to create its maps. The maps are published each Thursday morning, but the data included in the maps is only through Tuesday of a given week. This week, no rain fell on Wednesday, so there is no extra rain missing from this report. A widespread, steady rain moved through the Finger Lakes on Monday, with some enhanced areas of rain due to some strong thunderstorms. This was the primary source of rain during the last week. Many areas received over a half inch of rain, with some localized areas of 1-3 inches of rain. You can read a bit more about Monday’s event from my Tuesday morning blog post. Rainfall was generally near normal during the last week. While this will keep the drought from getting worse, it will do little to chip away at the drought. Rainfall amounts during the last week were generally over a half inch, mostly falling on Monday. While the rain was definitely beneficial, it did little to actually improve our situation. For the majority of the region, the rainfall last week was right about average, give or take a few tenths of an inch. Rainfall deficits across the region are generally 4-8 inches. In order to escape the drought, we will need to string together a number of consecutive weeks of above normal rainfall. An extreme rain event could statistically wipe away the drought, but would cause many more problems and is not at all desirable. Slow, steady and frequent rains are by far the best thing we can hope for in the Finger Lakes. There is some small hope for another small rain event Saturday night into Sunday. A storm system will approach the region from the southwest and could spread a wide area of rain and embedded thunder across the area. 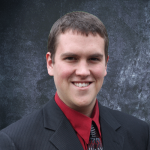 Current projections are for most areas to get between 0.25″ and 0.75″ from this. However, uncertainties still exist and the region could see less or more rain. At best, I think we can hope for another event to keep the area at normal for another week, thus slowing the progression of the drought. A few scattered showers or storms will be possible Thursday and Friday as well, but the majority of the area will not see much rain from these showers. Much of next week looks dry. A report came out last night from the City of Ithaca outlining the city’s critical water status. In a worst case scenario of no substantial rainfall and a continued use of water at current rates, the city could use its reserves within 30 days. For those unfamiliar with Ithaca’s water supply, the city is supplied by two rivers that flow into the city. A limited amount of water can be pulled from Cayuga Lake and filtered for use, but as I understand it, the filtering stations are already running at capacity. The response to this on social media has been tremendous. Knowing how environmentally conscious Ithaca is, I fully expect the city to band together and take voluntary actions to reduce water consumption. 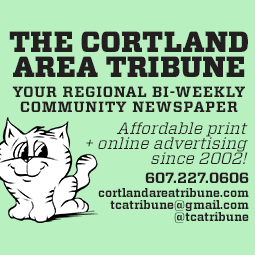 The rest of the Finger Lakes should watch Ithaca closely and follow its lead in conserving water until the drought breaks. Many in rural areas on wells have already been doing this, but it is a great idea for everyone. Some practical things that can be done to cut water use include fixing small leaks, reduce watering and cut out unnecessary watering and taking shorter showers.